Education Secretary Betsy DeVos waits to testify before a House Appropriations subcommittee hearing on Capitol Hill in Washington, March 20, 2018. Education Secretary Betsy DeVos faced blistering questioning from House Democrats on Tuesday as they confronted her on gun control, racism and LGBT rights. DeVos' testimony in front of a House Appropriations subcommittee got so tense that the chairman made a point of thanking DeVos for her poise when he concluded the meeting. 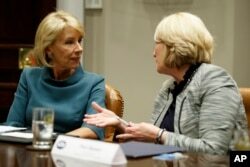 FILE - Secretary of Education Betsy DeVos, left, speaks with Commissioner Pam Stewart of the Florida Department of Education before a meeting between President Donald Trump and state and local officials to discuss school safety, in the Roosevelt Room of the White House, Thursday, Feb. 22, 2018, in Washington. DeVos said the commission would begin work within the next few weeks. A spokeswoman for DeVos later added that the panel would also involve students, teachers, law enforcement officers and mental health professionals as experts. DeVos said the commission would, among other things, consider whether to ban gun sales to people under 21. Trump initially spoke in favor of such a proposal, but backtracked on it after meeting with representatives of the National Rifle Association. DeVos would not tell the subcommittee whether she personally supported the idea. DeVos also defended states' and communities' rights to decide whether to arm teachers. "The question of school personnel being armed is very much one for local communities and states to grapple with," she said. DeVos added, "If there are going to be guns in schools, they need to be in the hands of the right people, those who are going to protect students and ensure their safety." FILE - Sen. Patty Murray, D-Wash., speaks at a news conference in Seattle, Feb. 21, 2017. 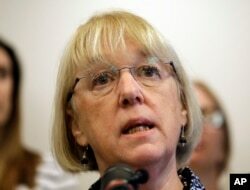 Senator Patty Murray of Washington state, the top Democrat on the Senate committee overseeing education, was upset that DeVos did not include any Democrats or any experts in the subject matter on the school safety commission. "I am not very optimistic that that will accomplish anything," Murray told The Associated Press. "Real experience is absolutely critical to get anything done." DeVos also faced scathing criticism from Representative Barbara Lee, a California Democrat, who said minority students were being disciplined much more frequently than their white peers for similar infractions. The Obama administration issued guidance in 2014 that instructed schools to pay attention to the problem. DeVos is now reviewing that guidance, and civil rights group fear she intends to rescind it. She would not talk about her plans at the hearing. "Your head is in the sand about racial bias and racial discrimination," Lee said. "Madame Secretary, you just don't care much about the rights of black and brown children. This is horrible." FILE - Rep. Katherine Clark, D-Mass., is pictured in Arlington, Mass., Sept. 8, 2014. 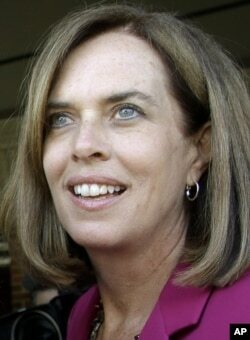 Representative Katherine Clark, a Massachusetts Democrat, launched into a tense back-and-forth with DeVos on whether she would require private schools that receive federal funding to follow federal civil rights laws that prohibit sexual, racial and religious discrimination. "Will you guarantee as secretary of education that that money is included with nondiscrimination policies for those private schools?" Clark asked. "Federal law must be followed when federal money is involved," DeVos said. "Is there some problem? Yes or no?"